COMSAT has agreed to provide Iridium Communications’ broadband service to warfighters and other users within the Defense Department by mid-2018. COMSAT will deliver voice calling, telematics data, environmental assessments, usage statistics, staff tracking applications and other capabilities to DoD users and military personnel through the Iridium Certus broadband service offering under the agreement, Iridium said Monday. Iridium Certus is supported by the Iridium NEXT satellite constellation and is designed to deliver L-band broadband services to mobile users at speeds of 352 kilobytes per second. 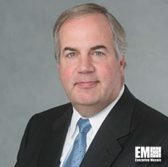 Iridium CEO Matt Desch said the company has collaborated with DoD through the Enhanced Mobile Satellite Services contract and expects the broadband service offering to complement its partnership with the department. “We’re excited to partner with COMSAT, who brings innovation and a broad portfolio of capabilities to the table, and we look forward to working together for many years to come,” added Desch, a 2018 Wash100 recipient. Iridium plans to perform four more Iridium NEXT satellite launches in 2018 and expects Iridium Certus to be commercially available by the middle of this year. The agreement with COMSAT came nearly two weeks after Iridium announced the first six Iridium Certus ground-based mobile service providers.